Electro Tech Powder Coating Discover the Amazing Benefits of Powder Coating with Electro Tech! From metal sculptures and signs, to playground equipment and more, powder coating is a more even and durable finish than standard paint. The unique powder coating process of adhering colored powder to metal items electrostatically, then heating the coating to form a “skin,” ensures that the finished items are vibrant and durable. If you are like many people who are new to the concept of powder coating, you may be wondering, “How does powder coating work?” When a metal item is powder coated, solid pigment in the form of a dry powder is sprayed on the surface. The metal item has a positive electrical charge, and as the powder is sprayed, the powder gun gives it a mild negative electrical charge so that the powder is attracted to the metal part and adheres evenly. This surface is then heated, which causes the powder to melt and harden into a solid, finished surface. Powder coating is both stronger and more eco-friendly than paint, and lasts much longer. That is why powder coating is ideal for metal items like bicycle frames, lawn furniture, car/ATV parts, and anything else that needs to withstand the elements long-term. Where Can I Find Power Coating Service in Southern California? 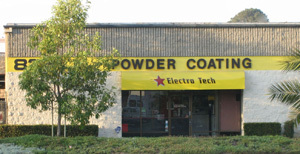 At Electro Tech Coatings, we specialize in both household and commercial powder coating jobs of all sizes. Electro Tech powder coating services have a proven track record of quality and dependability, and we serve San Diego and the surround southern California areas. Our family owned and operated powder coating company has built our business by providing top-quality powder coating services on time and on budget. To learn more about our services, including our large batch oven that is ideal for manufacturers and metal fabricators, contact us and we will be happy to show you the difference that Electro Tech’s superior service makes.